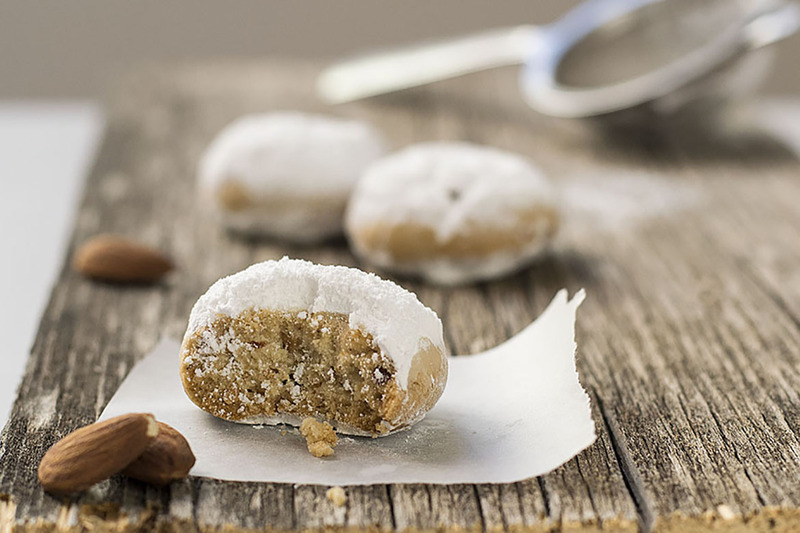 These almond snow cookies are also called “kourabiedes” in Greece. The original recipe requires freshly roasted almonds, whole or crushed — and real butter — made from sheep and goat’s milk cream. Real butter has a stronger smell and flavor than butter from cow’s milk. When I first smelled this butter I found it very overwhelming, and I cannot say that I enjoyed its smell very much, but something magical happens when it gets beaten with some sugar, then incorporated into the cookie dough and finally gets baked in a hot oven! For this recipe, though, you can still use any kind of butter you like, as long as it is good quality and comes from milk cream. In my case, I used half cow’s butter and half sheep & goat butter. 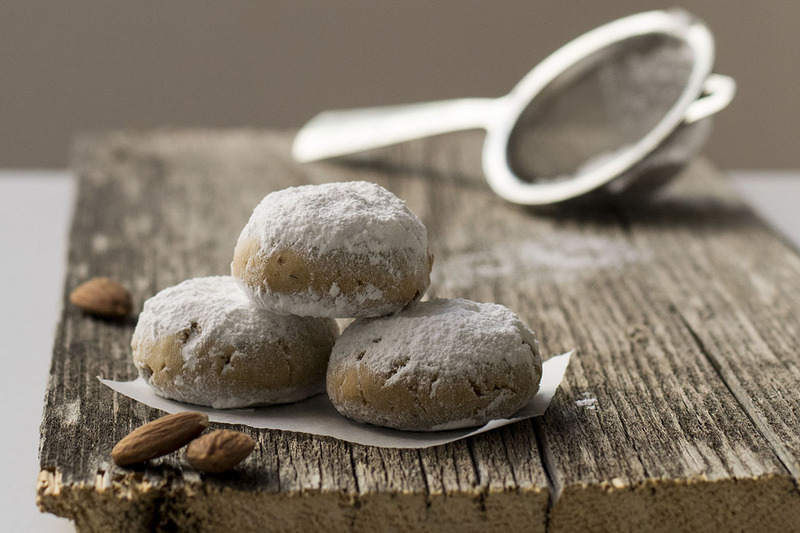 During Christmas every home in Greece has a plate full of these almond snow cookies and every visitor gets treated to some of this sugary confection. They are the perfect way for your kitchen to smell like holidays, and for your family to love you a little more! However, Christmas is not the only time these are baked, as they are also made as treats in engagement ceremonies, weddings and Christenings, because of their white color which represents purity. I, on the other hand, make them every time I feel the need to eat some! This recipe does not have a lot of ingredients — the stars here are the almonds and the butter. Baking powder is limited to only a teaspoon, which means that you should beat the heck out of the butter and sugar in order to obtain a really, really fluffy mixture. If you have the luxury to let your mixer beat it for 10-15 minutes, do it! That is the secret for a really good cookie. Another secret is to clarify the butter. I must admit that I do not normally do this, except on special occasions! If you read the ingredients on the packaging of the butter, you will notice that it contains about 15-20% water. What that means is that in one cup of butter there are about 3 tablespoons of water and a little more than 3/4 of a cup fat. This water will prevent the cookies from reaching their maximum tenderness level. Therefore, you may choose to remove the water and get some nutty browned butter (or beurre noisette) at the same time, but this is totally optional! If you don’t have a scale to measure your ingredients, then the flour should be lightly spooned into the measuring cups taking extra care not to compact it. Store in an airtight container at room temperature for at least 10 – 12 days. Don’t add too much flour and don’t over-work the dough because your almond snow cookies will come out tough. Bake low and slow, for the cookies to dry well and become very fluffy and crispy. This way they’ll also keep for a lot of days! When cookies are cooled, roll them in a bowl with confectioners’ sugar making sure that they’re completely covered by a thin layer of sugar. Store them in an airtight container and before serving, dust them with plenty more sugar to get the snowy effect. The original recipe calls for blanched, freshly roasted almonds. You can use almonds with or without their skin. Blanched (skinned) almonds will produce cookies lighter in color, but will not affect the taste. In the bowl of your electric mixer, with the whisk attachment, beat butter with sugar until really fluffy (10 – 15 minutes for best results). Add the yolk and beat until well incorporated. Add the vanilla, salt and brandy/cognac and mix until combined. In another bowl, mix together the 3 1/4 cups of flour, baking powder and almonds. Add them to the butter mixture and stir gently with a spatula or by hand until just combined and all of the flour is absorbed. Do not over mix! Over-mixing or adding too much flour will cause the cookies to be hard. Let the dough rest for 5 minutes. It should be soft and not sticky. If after the resting time it’s a little sticky, add a little more flour until pliable. Form little balls the size of a ping pong ball, flatten them out between your hands and make a shallow indentation in the centre with your index finger. Place on lined baking sheets and bake for 25 – 30 minutes or until golden brown and fragrant. Remove from pan and place on a rack to cool. Roll them in a bowl with confectioners’ sugar and store in an airtight container. Just before serving dust with more confectioners’ sugar. Enjoy! Born and raised on the Greek island of Crete, Makos Efthimis (aka The Hungry Bites) learned to appreciate the value of the Mediterranean diet from a young age. He grew up watching his mother and grandmother everyday as they went back and forth with spatulas, spoons and knives on hand, tirelessly chopping vegetables, greens and fruits and cooking traditional Cretan foods. His blog includes a bit of everything — one pan recipes, healthy dishes and some gluten-free, vegan or vegetarian recipes — but mainly centers around Mediterranean cuisine. For dozens of other authentic Mediterranean recipes, visit The Hungry Bites here and follow along on social media: Facebook, Instagram, Pinterest, Twitter and Bloglovin. Visit the Pappas Post Market for Greek products like extra virgin olive oil, honey from Crete and other delicacies available to ship to your home. Will you become a Patron for as little as the cost of a cup of coffee per month? Is The Pappas Post worth $5 a month for all of the content you read? On any given month, we publish dozens of articles that educate, inform, entertain, inspire and enrich thousands who read The Pappas Post. I’m asking those who frequent the site to chip in and help keep the quality of our content high— and free. Visit our Patreon page and start your monthly support today. When you become a Patron, you’ll also join an exclusive group of supporters that will have access to additional content and special offers that will be created just for you. The recipe is spot on, thanks for that. I usually opting for those I can find on Amazon. Petit Grecs is my favourite brand which do the traditional almond shortbread biscuits but also have an option with Greek coffee or walnuts for me who is allergic to almonds. Yummy!